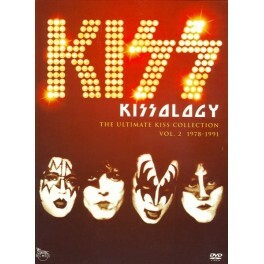 After the incredible introduction with Volume 1, it’s hard pressed to imagine that KISSology: The Ultimate KISS Collection Volume 2 could match the quality that it’s predecessor contanined. Simply put, Volume two surpasses the first release in terms of interesting material. This is the volume that covers the band’s peak of stardom, experimental period, flirtation with disco and hair metal, line up changes and the unmasking. While this volume certainly isn’t without it’s problems, it’s easily the most interesting of the series, simply because it showcases almost every line up of the band. While disc one is the shortest of the lot, only clocking it at 1 hour and 40 minutes, it packs a punch. It contains only three segments; the 1978 news excerpt “The Land of Hype and Glory,” the European theatrical cut of the made for television movie KISS in Attack of the Phantoms, and the hysterically funny Tom Synder interview. What’s interesting about this disc is you can literally see the band falling apart at the seams. This is most evident in the Snyder interview where lead guitarist Ace Frehley steals the show with all of his drunken exploits while bassist Gene Simmons looks on in sheer annoyance. It’s a shame that it doesn’t contain the full interview, but the excerpt gets the point across quite well. This was a band that was being torn apart by excess. Disc two commences with the music video for 1980’s “Shandi,” drummer Peter Criss’ final appearance with the band. What follows is a CNN interview segment with Criss explaining his departure. It’s quite humorous to listen to the contradicting stories between what Criss is saying and the audio commentary from vocalist Paul Stanley and Simmons. The 1980 Austrailian Invasion follows and begins what becomes a running theme within the KISS camp, member changes. This time, Eric Carr is introduced as the Fox character. Immediately you can see a reinvigorated band playing amped up versions of their classics on the Sydney show. In 1981, KISS cut their hair and decided to record a concept album. What resulted from this decision is an album that bombed so badly the band didn’t even tour in support of it. Instead, they only appeared on television and only performed songs from it ONE time. The performance is interesting, and it’s one of only a handful of video evidence of the Frehley/Carr line up. The third and final disc covers the most ground. Beginning in 1982 with the band’s huge outdoor Brazilian stadium show that showcased Frehley’s replacement, Vinnie Vincent, this disc breezes through the band’s unmasked years. In fact, between 1982 and 1989, there are only 15 songs split between 3 shows. However, they make up for it with the inclusion of the 1990 Hot In The Shade tour. This was the biggest stageshow in the band’s history. The setlist was incredible as was the energy. This was a band that was honoring it’s past without living in it. There’s always something that’s going to keep a set from being perfect. With this set, it’s the senseless edits and chopping up of shows. For some unknown reason, they decided to edit the profanity out of the shows. Regardless of how they feel about it now, the profanity was a part of their unmasked persona and it’s frustrating to hear silence in place of the words. They’ve also edited out songs for some reason and did not include one single full show. The Detroit ’90 show is the closest we have to a full show. All in all, KISSology Vol. 2 is an excellent crash course in the weird years of the band. The audio commentary is refreshing and honest, especially the heartfelt tribute to fallen drummer Eric Carr. Stick around following the closing credits to see Carr in his full glory. If you liked Vol. 1, then you owe it to yourself to see where the band went next. For it’s bargain bin price, you can’t really beat it almost 7 hours of material.